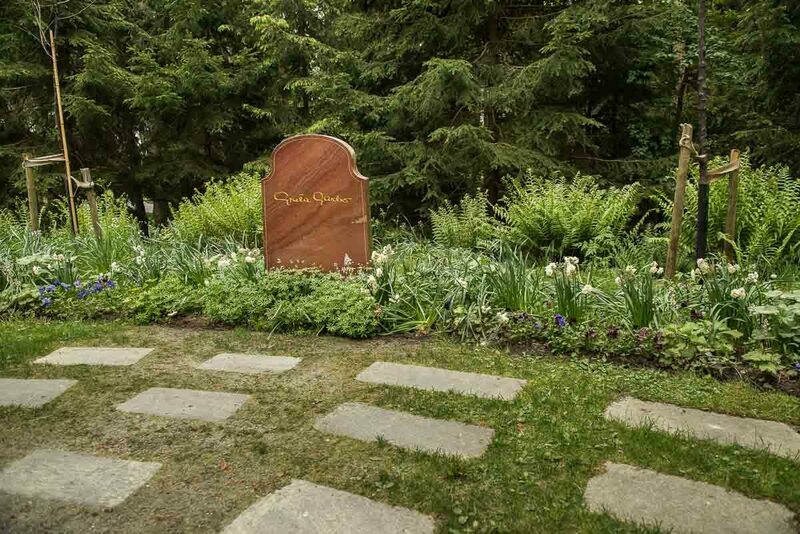 The simple but lovely grave of the Swedish film star, Greta Garbo. With an autograph. The Swedish film star of the early 20th Century, Greta Garbo, is probably the only person who is buried in the Skogskyrkogården Cemetery whose name you might recognize. We wandered around for a long time on a cold windy day looking for her grave. It was on a similar day when I was about 20 years old that I saw her on a street in New York. As you do when you see a famous person in New York, you make eye contact, so they know that you know who they are. Then you leave them alone. It’s not Los Angeles, for Pete’s sake. The stark granite cross on the hillside is so, well, Scandinavian. 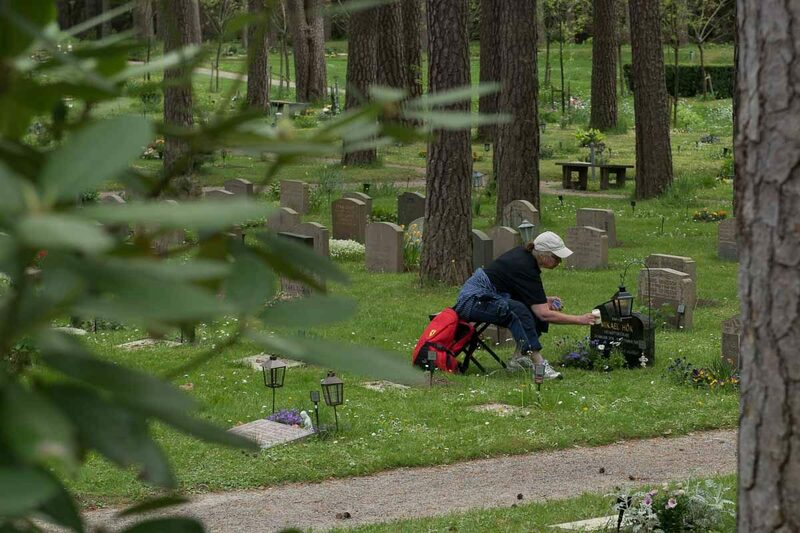 The Skogskyrkogården Cemetery is a Unesco World Heritage site, and, I must say, one of the more interesting ones we’ve visited. 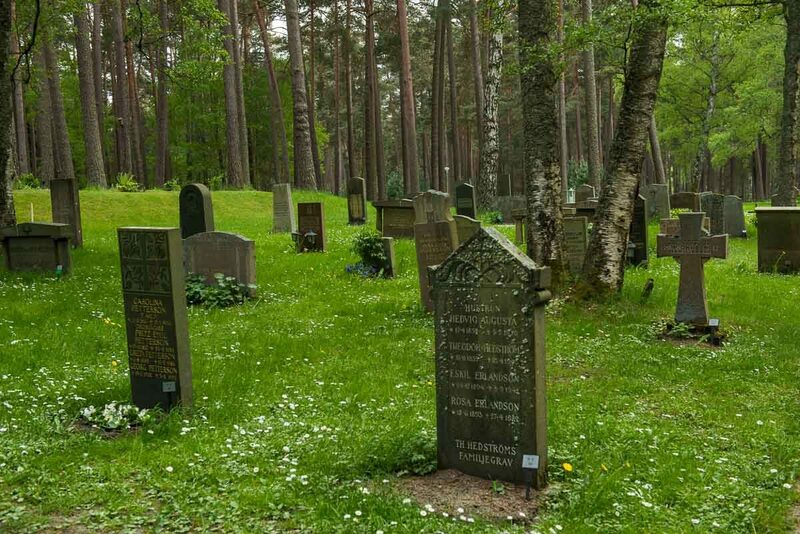 It’s a huge site, and unlike most cemeteries you’ll see, the graves are interspersed in a mature pine forest, which gives an air of natural serenity to the solemn site. The huge cemetery merges seamlessly with the surrounding forest. The site is also home to several unusual chapels and monuments that complement the natural beauty. 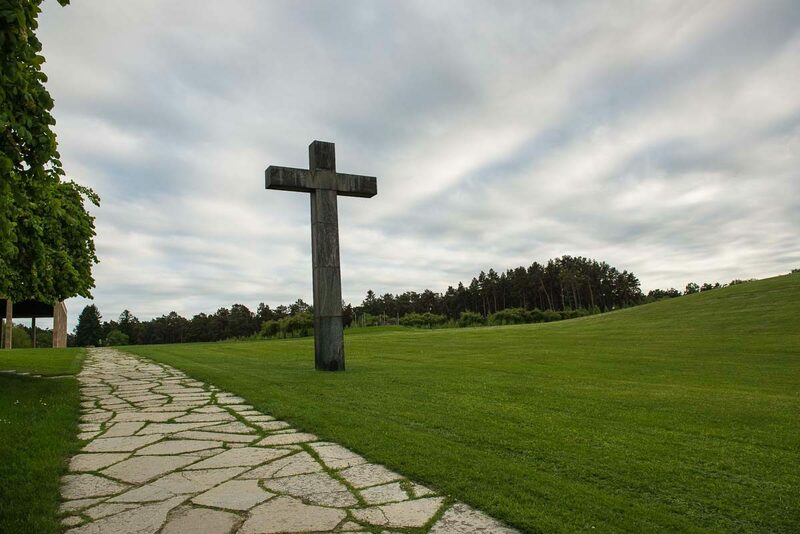 There’s a cross on a mostly bare hill as you enter. 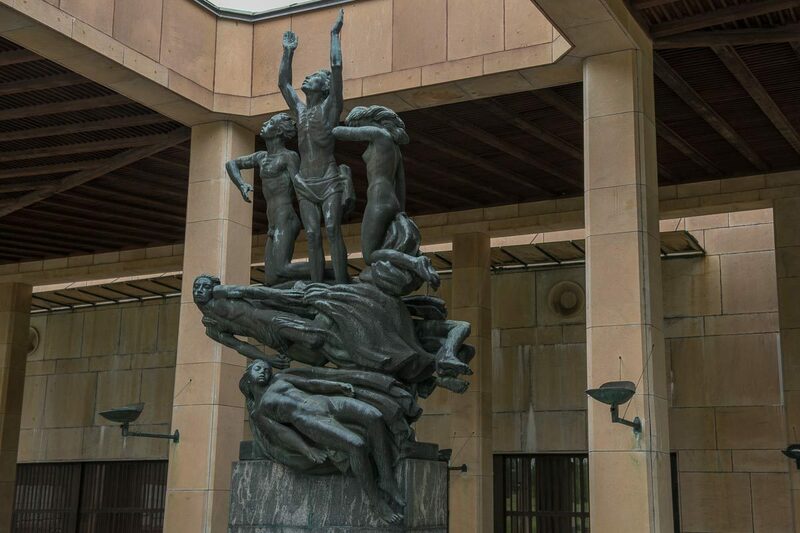 And on top of the nearby hill is a colonnade that houses a striking sculpture. The sculpture “Resurrection” by John Lundqvist. All in all, I think it deserves its status. We wandered among the various graves for a couple of hours, even though it was freezing cold and we weren’t dressed for the rapidly changing weather. Is one ever ready for the weather in this part of the world? Reminds me of Minnesota. Skogskyrkogården is connected to a metro station by the same name (see Skogskyrkogården metro station). It’s an easy visit from the center of Stockholm and well worth your time. If you like cemeteries. And we do. Skogskyrkogården is a UNESCO World Heritage site. Click this link to see a list of all the UNESCO World Heritage sites in Sweden, with links to the ones we’ve visited. I enjoyed your post; very interesting and your photos are beautiful. The sculpture is very profound; looks like it’s illustrating the rapture. Marilyn, don’t know how I missed your comment four years ago, but yes, the sculpture is amazing. I love how the lower figures are still seeming dead, while the ones above are headed for heaven. Beautiful sentiment and work.